The Shirt Dress is casual yet chic. The Long Men shirt trend is a absolute favorite of mine. Adding a belt creates a refined feminine spin on what is personified as masculine. This is a great transitional piece from summer to fall. Adding a pair of leggings or tights can make this a versatile all year around item of clothing. These ladies in the pictures below are some great examples of how this trend is done correctly. Below are some affordable pieces to add to your wardrobe. Ooh! I really like the Sandra pleated woven top and H81 Ruth woven tunic. You're right. 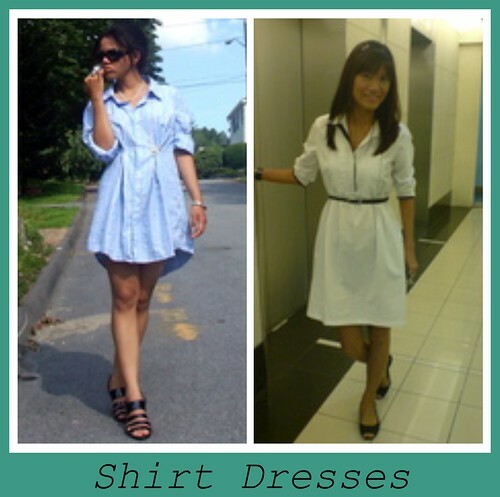 Shirtdresses are versatile, even though I will be the first to admit that they're not very falttering on thinner, more petite people. That being said, I really like the Monica shirtdress -- such pretty, soothing colors!